According to the National Highway and Traffic Administration (NHTSA) review of data published by the Fatality Analysis Reporting System Encyclopedia, there were 5,290 fatalities of licensed motorcycle operators in 2008 (most current statistics). Because of their smallness compared to passenger vehicles and trucks, it is difficult for drivers to judge the speed and distance of approaching motorcycles. Many times after a crash involving a passenger vehicle and motorcycle, the drivers of the passenger vehicles often say they never saw the motorcycle and were unable to respond quickly. In the event of a crash, a motorcyclist is much more vulnerable and in much greater danger physically than are other vehicle drivers. There are no protections for a motorcyclist such as the protection of the cab of a passenger vehicle, seat belt or air bag. NHTSA estimates that 80 percent of motorcycle crashes injure or kill a motorcycle rider, while only 20 percent of passenger car crashes injure or kill a driver or passenger in the vehicle. Always allow a motorcyclist the full lane width. Never share a lane with a motorcycle. Always and it can never be stressed enough, signal your intentions before changing lanes or merging with traffic. This allows the motorcycle driver to anticipate traffic flow and find a safe lane position. Keep in mind that motorcycles are often hidden in a vehicles blind spot. 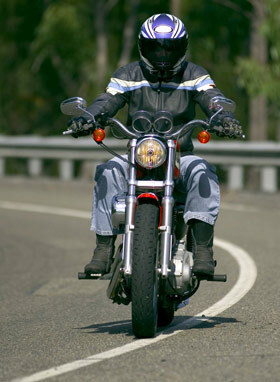 Always make a visual check for motorcycles by checking your side view and rear view mirrors. Don’t be fooled by a flashing turn signal on a motorcycle. Unlike passenger vehicles, turn signals on motorcycles are not self-canceling and drivers may forget to turn them off. Although some road conditions for passenger vehicle drivers are of minor annoyance, things like potholes, gravel, wet pavement or slippery surfaces, railroad crossings and grooved roads often force a motorcyclist to maneuver quickly into a safer lane. Allow more than the 2-second rule when following a motorcycle. This gives the motorcyclist additional time to change lanes or stop in an emergency. Also, never tailgate a motorcycle. Motorcyclists also have responsibilities to passenger vehicle drivers by following the rules of the roadway, being alert to other drivers, and always wearing protective gear including a helmet. (there are states that allow motorcyclists with a certain amount of motorcycle insurance to not wear a helmet when operating a motorcycle). Remember the motorcycle is a vehicle with all the rights and privileges of any other motor vehicle on the roadway. So keep your eyes open for motorcycles as well as other vehicles on the road and have a great and safe summer. Before you head out on the road, consider taking a motorcycle practice test before the summer riding season as a refresher.